Indian, mix and match, no brand endorsements. Always happens. When I design, I feel it, sense it. It becomes my way of being. 10:0! I’m all for style. Gradual evolution or one fine day bang on? Gradual. Will continue to evolve. I hate stagnation. Ever shopped from the women’s section? Oh yeah… Basics, like sweaters and stuff. Also, a pair of gum boots recently. Love them. Typical ‘good boy’ dressing – shirt and trouser. You know, like when my mum used to dress me. Why do you think male designers are more experimental in personal dressing than their female counterparts? If you notice, these are also male designers who create womenswear. It’s in the mind, you live it when you design… it percolates to your persona. Hence the experiments. 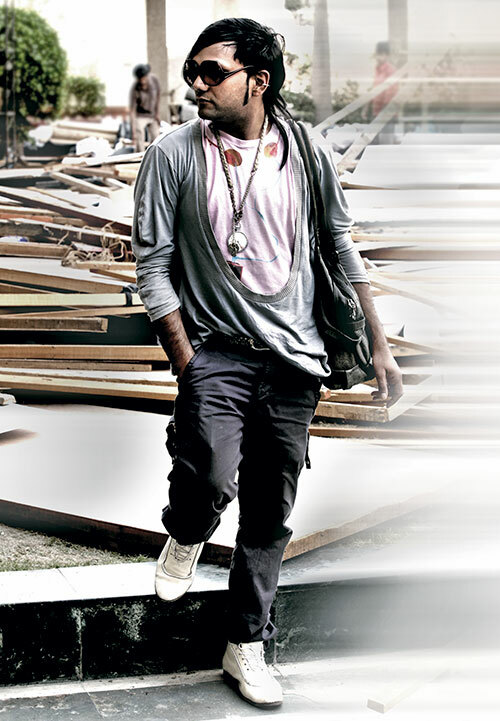 Indian designers whose personal style you note? Arjun Saluja, Narendra Kumar Ahmed. They’re not contrived. Abstract, random, hippy chic, graphic, sporty punk. Any flak for your dressing style, ever? I don’t dress up so much in India. Sometimes there’s too much attention. Or comments such as ‘joker’ or ‘scary’. But not too adverse. It was more so some years ago. Now, not so much. Jeans by Marithé et François Girbaud. 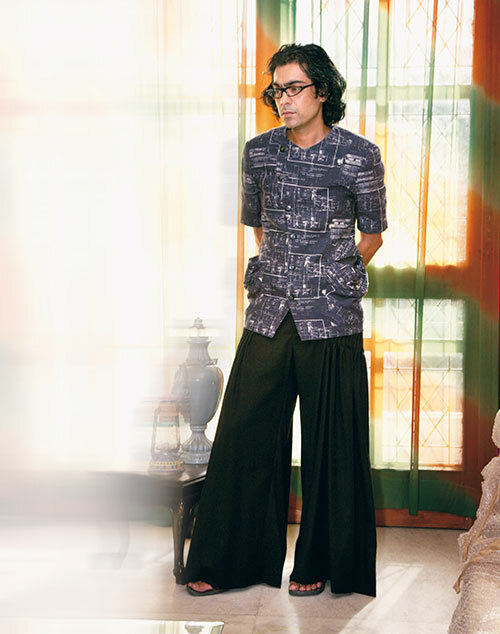 Trousers by Gaurav Gupta. I love All Saints, Comme des Garçons, Hussein Chalayan and Vivienne Westwood. Is it important for a designer to evolve with his own dressing? No, not really. It’s a personal choice. Some people dress more. Some, not so much. Fashion is dominated by women. It’s more for them. They don’t need to prove a point or need a reason to dress up. Men feel the pressure of restrictions. For designers, fashion is a freedom zone – to be experimental, obnoxious, whatever. And most male designers are gay; therefore, more colourful (not literally). I’d love to be thinner. Would go towards ‘costume’, at least the more interesting points. It’d be ‘more’, but chic too. Less is more? Or more is good? Less is as good as more…as long as it makes sense. Ever camouflaged/countered physical/psychological insecurities with dressing? Not really, I’m pretty confident about my body and comfortable with it. There are always times when one isn’t sure about something and wants to divert attention. One can camouflage, but I’d rather highlight my strength than try to cover up my insecurity. Yes I have. Cardigans, T-shirts, sweatshirts, jackets. Lots…no matter how confident you are, there are always places, situations and people that make you think, “I wish I hadn’t…” My studio is in a tiny village in Delhi. There are always times when I question myself while walking out of the lanes, if I’m appropriately dressed for the place. Sometimes I want to be seen and sometimes I just want to blend in. 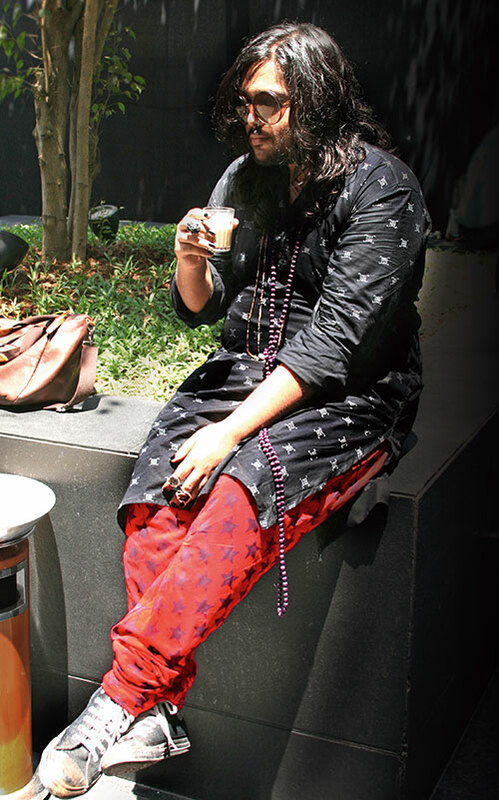 Indian designer/s whose personal style you note? Older and sober? Or older and wilder? Old or not – wild for sure! Easy, comfortable. It also stems from what I make. They are interconnected. I design my own clothes too, therefore, there’s a synergy between what I create for the runway and what I create for myself. They feed one another. Your comfort to style ratio? Comme des Garçons, Vivienne Westwood, Prada, Hussein Chalayan, Nicholas Ghesquiere for Balenciaga. Designers whose personal dressing you take note of? Vivienne Westwood, John Galliano. Here, Anand (Kabra) dresses individually. Trousers. But they have to be comfortable. Well, lots. Happen every now and then, I think. There are more genres for women. The boundaries are wider. There is very little variety for men. Styles are more limited. So when men wear something slightly ‘off’, it is looked at as experimental. Gradual evolution or one fine day bang-on? Evolution for sure, but very subconsciously. My dressing has evolved with my designs. Elements from menswear, elements from womenswear, shapes – it continuously evolves. I don’t know. (Long pause) No, seriously, I don’t know. How many white shirts do you own? About seven or eight, I think. Schoolboy is introduced to rock-and-roll! Rock-and-roll influence me a lot. I like an English sensibility. Am drawn to Victorian or Edwardian costume, particularly from the 16th or 17th centuries. When did you hit your present dressing style? 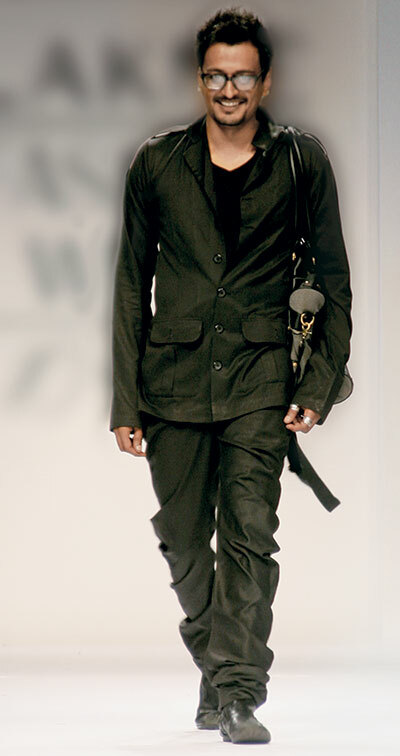 During my college days, as a student at NIFT. They’ve always seen me in formals, and they prefer it that way. They don’t like it if I dress casual. They think my torn jeans are distasteful. And they absolutely hate my ‘grass’ and ‘chillum’ print T-shirts! If someone close criticises your personal dressing, how would you react? I’m a very patient listener. Sometimes, because I don’t speak or interrupt, people might think I’m not listening or ignoring them. But I take it all in and then judge for myself. I remember going through a hat phase and my friends would say, “You look ridiculous!” I did and took their advice. Well, at that time, I felt pretty cool. Flat bottom trousers – I wore them a lot. Don’t anymore, thankfully. What items of clothing do you make for yourself? Well as of now only T-shirts – which I print – and cravats. I’ll start creating more stuff for myself soon. My work, maybe. And my passion towards it. I like the way Gaurav Gupta and Arjun Saluja dress. Hmmm… I’d like to be a rock star when I’m 60! To dress and act like one. Magpie, random, flea market, lent, borrowed, stolen. Does being too comfortable kill style? It might kill a fashion trend, but style is eternal. Have friends/family influenced your style? Subconsciously, yes. I randomly went through my mother’s jewellery chests. Absolutely, but no one dictates the time frame. Whether six months or four years – there’s a gradual evolution. Where do I begin? Green and orange hair extensions during college. Used to be a travelling jewellery trunk show. Have sort of reined it in. I would hear them out, but implementing is totally my call. Depends on my mood – I might ignore or have a verbal spat. Or beat the crap out of them! Anything alien draws out reactions – positive or negative. In India, people are more vocally reactive. It’s easier for men to bear the brunt of criticism than for women. In a tie-dye caftan, long grey hair, flip flops and a Japanese fan. Running down the road to buy smokes from the neighbourhood stall. Imaginative preppy boy next door. Always! But I opt for clothes which look more unisex. 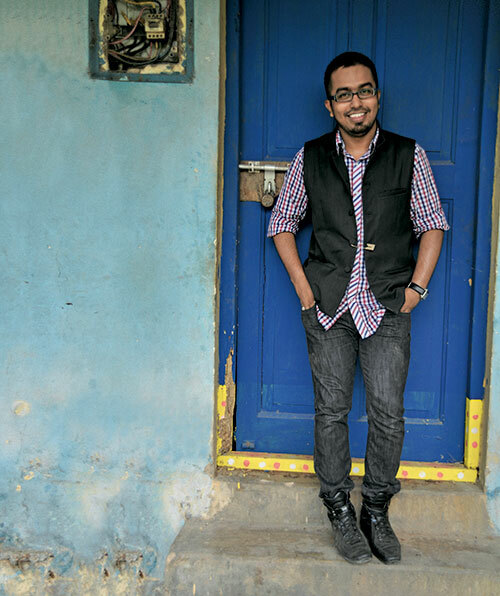 Skinny denims, jumpers and basics fit better and are good for men’s liberation. Spontaneous daily. Planned on a day out. My only insecurity is my small tummy which I pull in, like a 24/7 yoga routine. Else I layer clothes. When I was a blond junkie! A natural glow that every fish eating Bengali has, and imperfections that prevent me from being boring and ‘cute’. has a very strong classic style. Older and outwardly sober, but inwardly wilder!